When Giulio was murdered, it had a profound impact on me and others not just because of the shocking injustice, but also because it tore down the illusions of our own defences. 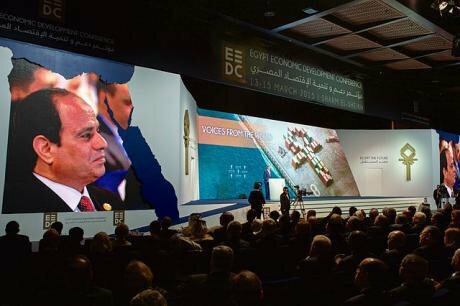 Sisi on big-screen monitor listening as John Kerry delivers remarks to Egyptian development conference at the Congress Center in Sharm el-Sheikh, Egypt, March 13, 2015. Wikicommons/State Department/ Public Domain.I never knew Giulio Regeni. I wish I had; his research was important and fascinating, and everyone close to him recalls a funny, warm and deeply humane young man. But when news of his disappearance first spread in those sickening days following the January 25 anniversary in 2016, I felt like I knew him. Part of the reason I felt that way, I think, is that Giulio belonged to a particular class of Cairo-dwellers, one that I’m particularly familiar with because in many respects I belong to it myself. He was a foreigner who moved to Egypt because he was intrigued – intellectually, politically, personally – by the country, its nuances and its rhythms; he was someone who wanted to understand the struggles of marginalised Egyptians on the ground, not hobnob with bigwigs in the corridors of power. He was in that class of Cairo-dwellers who you tend not to see, for the most part, getting suited and booted for expat receptions at the embassy; you’re more likely to find them downtown, in Stella bar, gossiping and eating termus and looking gloriously scruffy and unkempt. Those of us inside that community had a complex relationship with state violence, violence which in one form or another (as journalists, academics, employees of NGOs) we often documented as part of our work. By virtue of the fact that we were not Egyptian, we stood out, and in a climate of government-sponsored xenophobia and chauvinistic nationalism, that made us targets. But we were also, or so we thought, protected to some degree by the privilege of our foreign passports and in many cases the particular fact of our whiteness: never exposed to the same degree of danger that our Egyptian colleagues face every day, and never likely to suffer without consequence as non-Egyptians of colour have in recent years – from trafficked African migrants in the Sinai to the Mexican tourists gunned down by Egypt’s army whilst on a desert safari in 2015. We were aware of how problematic that privilege was but we also depended upon it, and consciously or subconsciously we made it part of our identity in Egypt, part of our sense of self and our relationship to the country we now called home. And so when Giulio was murdered, it had a profound impact on me and others in a similar position: not just because of the shocking injustice of what happened to him, but also because of the way in which it tore down the illusions of our own defences. Others have spoken eloquently about the fight for truth and justice for Giulio, and so I won’t tread over the same ground. But what I would like to do is draw attention to two dimensions to Giulio’s story which I think are vital to bear in mind when thinking about his killing, dimensions which I suspect – even though I didn’t know him – Giulio himself would have been highly sensitive to and keen to stress to a wider audience. Alongside that legal intimidation is a more insidious attempt by the regime to delegitimise the very notion of journalism. The first is the wider context of authoritarian brutality in which his ordeal unfolded. Whichever metric you use – extrajudicial killings, tortured detainees, cases of cultural censorship, violations of academic freedom – Egypt is currently undergoing its most vicious iteration of dictatorship in living memory. In my own sphere, reporters have been particularly affected. Egypt is now the third biggest jailer of journalists on the planet after Turkey and China. Last year the press syndicate building in Cairo, traditionally something of a refuge for members of the media, was attacked for the first time by security forces and its leaders arrested; since Sisi’s ascendancy, reporters have been hit by a blizzard of travel bans, defamation suits, and arrests. As I speak, Al Jazeera journalist Mahmoud Hussein is being held on charges of ‘disseminating fake news’; the photojournalist Shawkan has been incarcerated since 2013 and could face the death penalty; Abdallah el-Fakharany, also detained in 2013, is now serving a life sentence behind bars. Alongside that legal intimidation is a more insidious attempt by the regime to delegitimise the very notion of journalism. President Sisi has warned of ‘fourth-generational warfare’ being waged against Egypt by the press and says that journalists who “harm Egypt” will be “held accountable before god”. When legitimate questions were asked about the successes and failures of the state’s much-hyped and highly expensive widening of the Suez Canal (which has so far yielded a 0.0033% increase in revenue), Sisi claimed that “To question national projects is to aim to break Egyptians’ will”. Parliamentary speaker Ali Abdel Aal has announced he is compiling a list of domestic and international journalists who “disseminate seditious content”. And of course this crackdown extends well beyond the media world. The brilliant El Nadeem Centre, which helps to rehabilitate victims of state violence recently released its annual report giving statistics for some human rights abuses over the past year. In 2016, there were almost a thousand forced disappearances, as well as more than 500 cases of individual torture, more than 300 cases of collective torture, and more than a hundred deaths in detention. Today, there are an estimated 60,000 political prisoners in Sisi’s jails. Late last year I interviewed El Nadeem’s co-founder Aida Seif ElDawla: “This is the worst situation when it comes to the killing and torture and starving of detainees in prisons that we have ever seen,” she told me. A few weeks later security forces stormed the organisation’s headquarters in downtown Cairo, and shut it down. So I think it’s important to place what happened in Giulio against that backdrop, and to be vigilant against any efforts to isolate his murder from that broader context of state violence which continues to impact upon and destroy the lives of so many Egyptians every day. And the second thing I wanted to underline is how culpability for that state violence – its scale and depth and ferocity – cannot be confined inside Egypt’s borders. Egypt’s western allies were always complicit in Mubarak’s autocracy; for them, the nature of Egypt’s security apparatus was an asset, not an aberration. Egypt, for example, was a key partner in the CIA’s extraordinary rendition programme during the Bush-era War on Terror. “If you want a serious interrogation, you send a prisoner to Jordan,” explained one CIA agent at the time. “If you want them to be tortured, you send them to Syria. If you want someone to disappear – never to see them again – you send them to Egypt.” Donald Trump has labelled his Egyptian counterpart ‘a fantastic guy’.